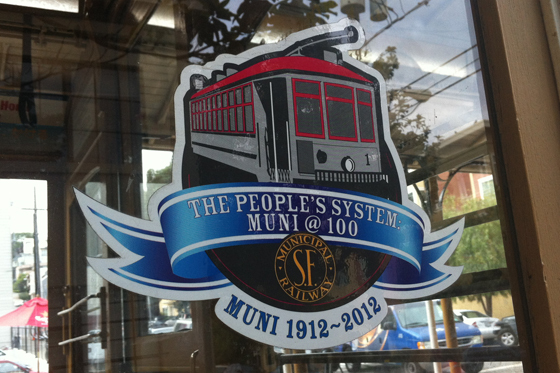 Today is the 100th Anniversary of San Francisco’s Muni system. 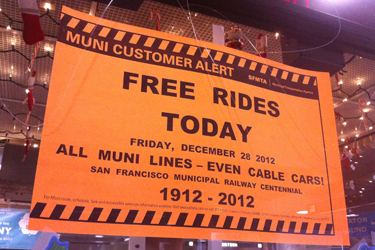 To celebrate, Muni rides were free for everyone! 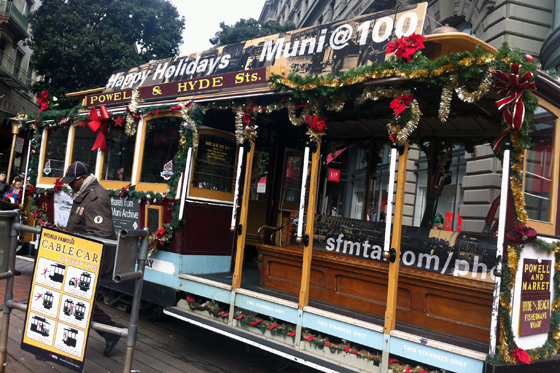 Nick and I decided we’d go and enjoy each of the City’s Muni cars, and enjoy the great San Francisco Municipal Railway. We hopped on the 33 and took it down to the underground station. 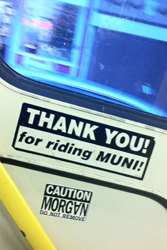 Although the bus had a “Free Rides Today!” sign, that one was hand written – the Muni station had a fancy printed one! Nice. We hopped on a downtown train. 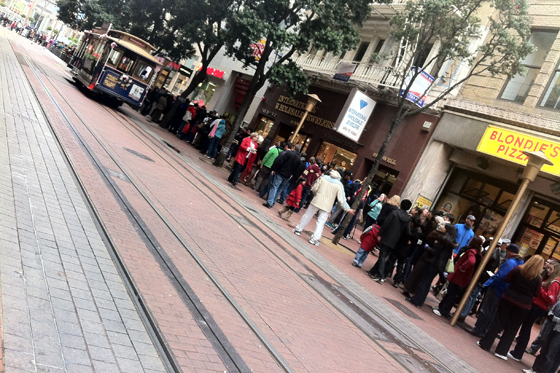 We got to the famous Cable Car Turnaround just off of Market Street, and the line was hilariously long! But we wanted to kind of do the nostalgic, touristy thing and weren’t in a hurry, so we hung out in the line and waited. It was fun seeing all the different kinds of people waiting to ride the cable car, and wondered if people thought this was how long the line normally is (it isn’t – this was about five times as long as it usually is – when it reached the end of the block just past Blondie’s, it actually doubled back again. Crazy!). There was even a news guy there. Literally. The poor guy had to set up his own camera and everything. I guess the story wasn’t as huge as the line. Ha ha ha! Some of the cars were decked out for the occasion. Loved these! 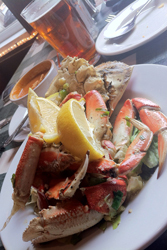 After our fun ride to Fisherman’s Wharf, and a fantastically delicious meal of Dungeness crab from Nick’s Lighthouse (where I had street stall crab for the first time this year, too! 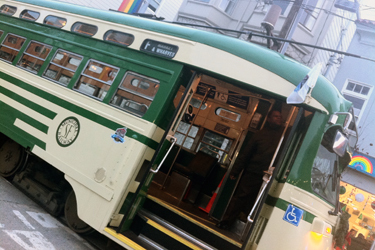 ), we hopped on the F train and rode it all the way back to the Castro. And thanks to NextMuni.com (which I actually used for the first time this year, too! 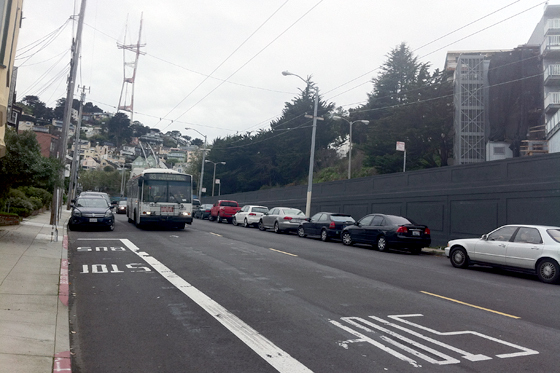 ), we found out a 33 was heading up the hill just as we neared the stop. This was such a fun day. 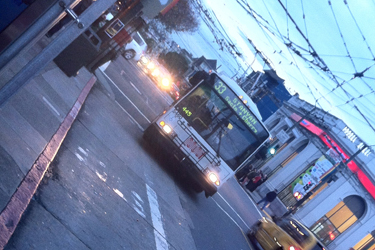 A lot of people complain about our Muni system, and I’ll be the first to admit there are a lot of things that could be improved on, but in riding all the different cars today, I realized it really has gotten better in the past years because of the technology we have now. 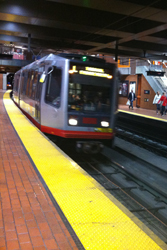 If you’re waiting for an underground train, you can see on a monitor in the station when that car is actually in the subway, which lets you know it will probably arrive on time (barring any problems), and thanks to NextMuni.com, you can figure out when the next bus should be arriving at the stop you’re waiting at above ground. 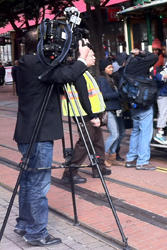 And seriously, how cool is it that our Cable Cars are a national landmark? 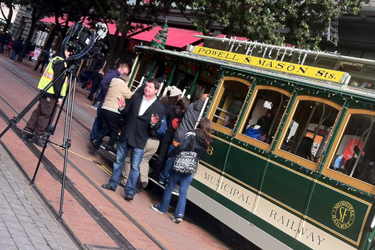 If you haven’t ridden a cable car yet, come ride one! That looks like it was super fun! Maybe I’ll do it next year.